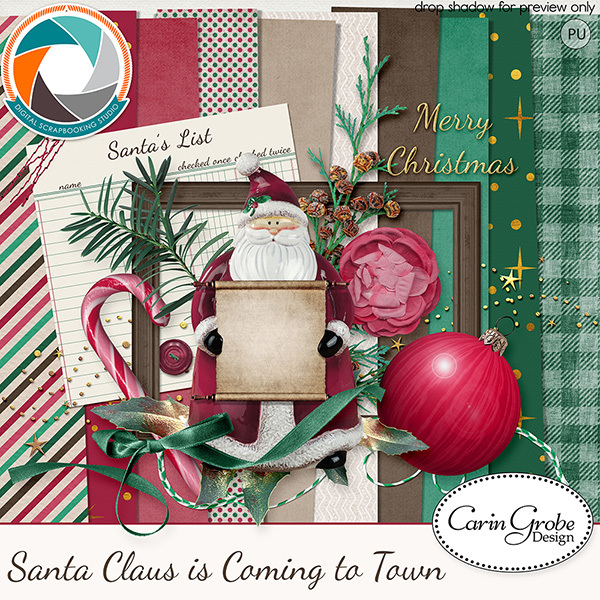 Welcome to the Studio’s Annual Christmas Carol Blog Hop. Every year the Studio Designers gather together to “sing Christmas Carols” to all of our members, customers, fans & friends. It’s a way for us all to say: “Merry Christmas and a big Thank You for being so supportive”. I’m so happy to be part of this fantastic Holiday Blog Train again, this year, after taking a sabbatical last year 😀 Creating a kit around a Christmas Carol has turned into a fun way to get into the Christmas Spirit, because usually I can’t get the tune of my chosen song out of my head for days, lol. This year “my” song is “Santa Claus is coming to town”. I love how it’s always getting me into a happy, festive mood. And here are the download links, make sure to get both parts, the elements and the papers! Downloads will be available until January 2nd. The free downloads are no longer available, but you can find the minikit here in my store. Please, remember we are living all over the world in different time zones, be patient if a post should not be up yet and check back again later! Thank you, Min! This is lovely — the colors are beautiful! May you & your loved ones have a blessed & wonderful Christmas!! love the kit, thank you. Thank you very much for the beautiful gift. Merry Christmas to you and your family. beautiful kit. thanks for sharing and merry Christmas to you and yours! Love it, thank you so much and Happy Christmas. Большое спасибо за прекрасный набор! Счастливого Рождества! Hallo Carin, vielen lieben Dank für dein Kit. Es gefällt mir sehr. Ich habe übrigens eine Facebookgruppe die ausschließlich für deutsche Scrapper, Tuber, Künstler usw. ist. Würde mich freuen, wenn du dabei wärst. https://www.facebook.com/groups/158410178110431/ Das ist der Link. Beautiful Carin and thank you so much for sharing with us!! Wishing you a Blessed Christmas and Happy New Year. Thank you so much! So beautiful and I LOVE the colors! Beautiful!! Thank you so much for sharing 🙂 May you and yours have a very Merry Christmas, and a Happy New Year! Sweet kit! Thanks so much! This is color, textures, and beautiful fun! Thank you so much. Merry Christmas to you!